Published on the 02 August 2007 in Web stuff, Writing and tagged . 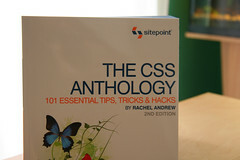 The 2nd edition of my book ‘The CSS Anthology: 101 Essential Tips, Tricks and Hacks’ has now been released and is available from Sitepoint. This updated version covers Internet Explorer 7 and newer techniques made possible by widespread use of standards compliant browsers – while always bearing in mind how to ensure accessibility of your content to those using older browsers or alternate devices. This book is published in full colour making the examples far easier to follow, having received my author copies I’m really impressed with how it looks and the difference that colour makes to a book like this. It was, as always, good fun working with Sitepoint on the book and I hope that the end result is useful to people trying to learn or improve their CSS skills. I really like the cover designs SitePoint are using now. Can’t wait to see the book. Your 1st edition was excellent but the only comment I made at Amazon was that I would like to see it in color. Well, it seems I’ve got my wish. Very anxious to see it. I have recommended this book to several people and lent it out (reluctantly) to several more. Best of luck with it and your running!